alaTest has collected and analyzed 36 reviews of Creative Live! CAM Connect HD. The average rating for this product is 3.1/5, compared to an average rating of 3.6/5 for other products in the same category for all reviews. We analyzed user and expert ratings, product age and more factors. Compared to other products in the same category the Creative Live! 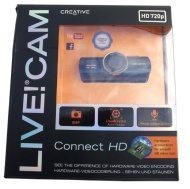 CAM Connect HD is awarded an overall alaScore™ of 85/100 = Very good quality. The mid-priced Creative Live! Cam Connect HD doesn't stand out on performance or features, but it's a noticeable upgrade from the built-in webcam on the average laptop lid. Sleek, diminutive design. Plug-and-play compatible. Skype HD certified. Clear audio recordings. Noisy video recordings. Only captures mono sound. Doesn't record in 1080p.